Melodive is one fun, crazy fall that's tough to control. I’m all for procedurally generated (and thus nearly limitless) content. At times I enjoy games that simply try to entertain us instead of getting too cerebral or money-hungry. And generally I love off-the-cuff experimental games. At the same time, I’m not too fond of having to fight the controls every step of the way as I attempt to enjoy myself. 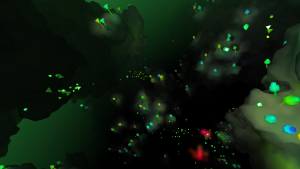 Melodive is just that: a simple, endless, experimental game. Players guide whatever it is they’re controlling through a procedurally generated cave system as they attempt to make it as deep as possible before they inevitably crash. Tilting the device steers while tapping and holding the screen can be used to boost, and gathering up streams of colorful particles will recharge everything. 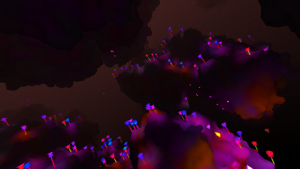 The environment’s shape and colors will shift and change along with the music depending on each player’s progress. It’s hard not to enjoy Melodive’s simple beauty. The visuals are basic but can lead to some rather stunning subterranean vistas and the music always seems to fit what’s on the screen. It can be a fairly peaceful, trance-inducing trip drifting through all of those trippy underground caves. It can become a little disorienting at times thanks to all the flipping and turning but that’s why all those mushrooms are there: they always point up. Unfortunately it’s still incredibly easy to get disoriented and even tank prematurely thanks to the controls. It’s not so much that they’re unresponsive but rather calibrated in a manner that I find incredibly awkward. Rather than tilting left and right to turn in those directions respectively, it causes the camera to spin. This means if I need to take quick evasive action to avoid something in front of me I have to spin to one side, then “pull up,” then try to level out. After several attempts I’ve been able to adjust to it with limited success but I still think a more traditional (read: easier) iOS tilt configuration would make it much less frustrating. Even with a set of rather unwieldy controls Melodive can still be a relaxing and entertaining trip. The fact that it sports a different configuration each time only makes it that much more appealing. I’d say as far as simple, endless time wasters go, it’s definitely worth checking out.